I’m back with our last day of February Release Week with Newton’s Nook Designs! And oh what fun you are going to have! Our favorite feline is back and there is cake (and cupcakes)!! How could anyone resist?! I think this set is simply a must have. A cat, some cake and fabulously fun sentiment! Talk about knocking it out of the park!! It is hard to tell from my picture here but my card is actually a “wobble” card. And because you just have to see it in action, I created a video to show you. I colored the image with Copic markers (colors below) and then added an action wobbler behind the die cut image. On my video I show you how well the dies line up to make your die cutting perfect every time. Love that! 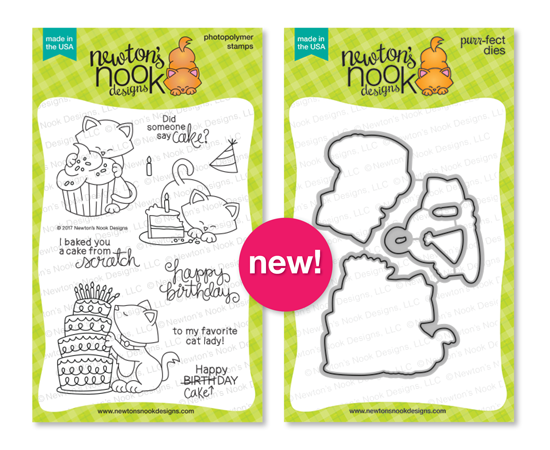 Would you like to win the “Newton Loves Cake” Stamp Set? Comment on the NND blog and Design Team blogs (see list below)! The winner will be chosen at random from the collective reveal posts. Make sure to check out each of their blogs and comment for your chance to win. You will not know which blog has been chosen so the more you comment on the better your chances are of winning! You have until Thursday February 16th at 9pm CST to comment — winners will be announced on the blog post on Friday, February 17th. I hope you have enjoyed all my projects for the February release. The design team has done a marvelous job of showcasing these fun products and I hope you have gone to visit everyone! The products will be available tomorrow (Friday) so happy shopping! Thanks so much for stopping in! I love this, I really need to make an action wobble card! So this card just jumped out at me, I LOVE the bold coloring and those stripes are a big YES! You’ve reminded me how much I love diagonal stripes on cards. Fabulous card! Love your coloring and how the images pop! Another sweet Newton card. Love the combination of the black and white with the colorful cake. Great card! The little kitty with the cake is adorable! Love the colors! Awww!!! What a cutie card!!! Too sweet!!! Aah, so cute! Beautiful card, and I love these stamps! Yay! who doesn’t love cake and cupcakes?! I love your Copic coloring! Thanks for the video! Oooh! This is so fun! I love the colors you used and the video is so cool too! Thanks so much! Your copic coloring is amazing! How fun and cute is this! Fantastic card! Love your video too! You have such a sweet voice!!! 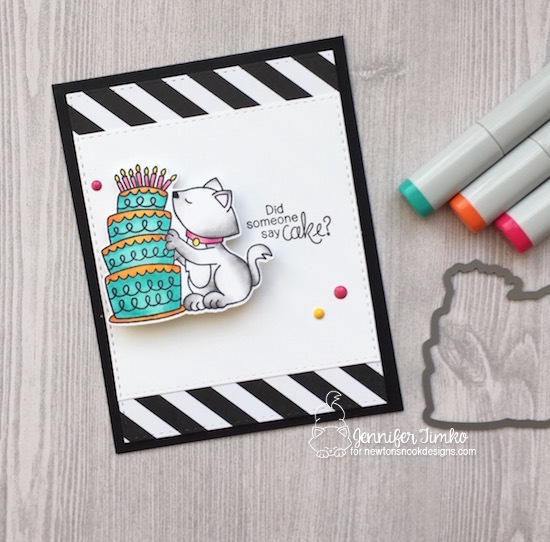 Fun card with awesome coloring! Love the wobble! Using the wobbler was genius. As soon as I saw that image, I knew Newton was going to have that whole cake over onto the floor!! lol… Fabulous coloring on your wonderful card. Adorable set! Would love to design using it! Cute design. Cute set. Love it! I love the wobbling element on this card and your coloring is perfect. Thanks for the wonderful video. Yup…SUPER CUTE! Love it Jen! So cute–love that it wobbles. Fun card, I love your black and white background. This is such a fun set! Cjute card. I love these stamps and dies. Great card! Love the black and white background – really makes the brightly colored image pop! Great card. Love the splash of color on the cake. 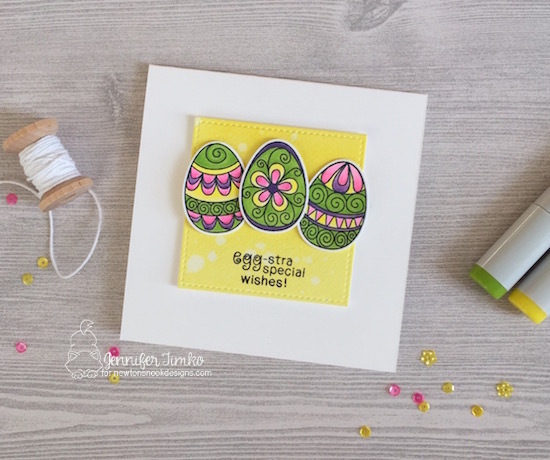 I just love your card, love the colors and the wobble effect is wonderful. Can’t wait to make one myself. Thanks for the idea! This is adorable! You are totally rocking these cute stamps! So stinkin’ cute! So where do you get the action wobble pieces? If you linked it, I missed it. So adorable, love your coloring…image really pops!! You have captured Newton blowing out his candles perfectly and this card is perfect for a guy or a gal! OMGosh this card is A-dorable! Thanks for the video on how to make it wobble, I just love that! I am really loving all of the creativity with Newton’s Nook images! Jennifer, your coloring is amazing and I love the black and white stripes!